Another day means another round of snow storms. It seems that this Chiberia winter will never end. From bitterly cold temperatures to piles of snow, this winter season is driving everyone to their wits end. The biggest pet peeve that I have during the winter is un-shoveled driveways and sidewalks. The walk to the bus-stop shouldn't be a dangerous obstacle. With the Epica Non-slip Ice Cleats, my morning walk to the bus stop is a lot easiers. The Epic Non-slip Ice Cleats provide traction on the cold, slippery surfaces. These cleats arie made from a synthetic rubber that maintains its flexibility in cold temperatures. The steel spikes provide a secure grip on the icy or snowy surfaces. Each step is more secure with the added traction. The best part about these ice cleats is that they work with any shoe. From the heavy snow boots to gym shoes, the traction is much improved. The design stretches with the size of your foot to ensure that the ice cleats stay in place. Since heavy cleats can be cumbersome, this version is light weight. It is hard enough trekking through snowing paths. These ice cleats are light weight and flexible. It makes wearing them for any duration easier. 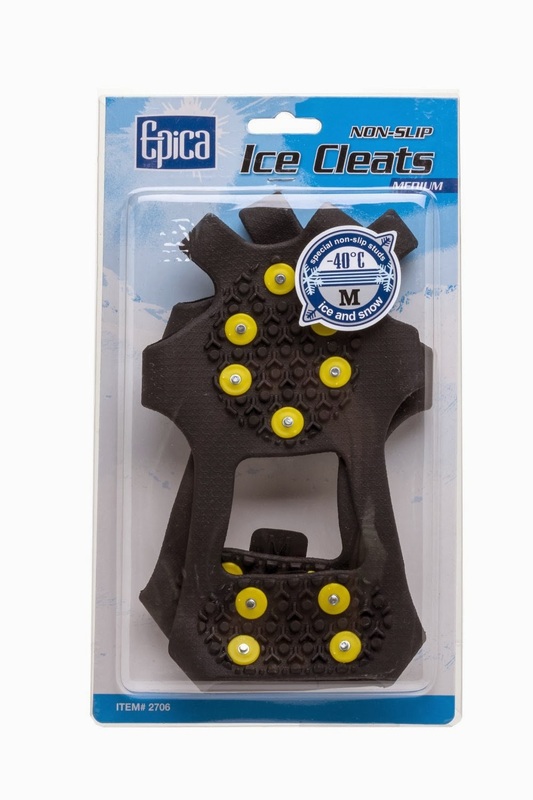 Epica Non-Slip Ice Cleats can be purchased on Amazon.com. They retail around $20 a pair. Definitely a bargain for increased safety during dangerous winters. Walk more sure footed this winter with a pair of Epica Non-Slip Ice Cleats.